Will Cornell stand by SOM to build NYC Tech Campus? - Archpaper.com Will Cornell stand by SOM to build NYC Tech Campus? Will Cornell stand by SOM to build NYC Tech Campus? 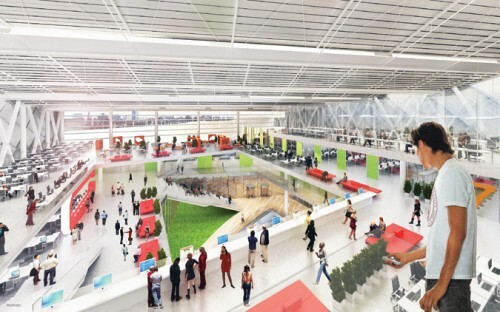 Inside the proposed Cornell campus. Multiple factors helped the Cornell/Technion team win what is shaping up to be Mayor Bloomberg’s favorite super-scale legacy project. Stanford, the only real competition, withdrew; a windfall of a $350 million donation blew in; local Cornell alums pulled out the stops with petitions. High on that list is SOM’s preliminary design proposing a net-zero building and a permeable landscape, developed with Field Operations, woven in, over, and into multiple structures lending an interactive and public character to the entire campus. This wholly sustainable, radically accessible design plan has become a signature of the project as the city ambitiously strives to become an East Coast high tech start-up incubator bar none. And yet it is unclear if SOM will remain on the job. Amidst rumors that the same Cornell alumni who helped get the prize now want to see a Cornell architect get the job, Cornell administrators close to the project were vague when asked if the SOM team would be seeing the project through. “SOM has served us fantastically well,” said Kent Kleinman, the dean of Cornell’s College of Architecture, Art, and Planning (AAP). “The next phase will start immediately and proceed according to our standard RFP process. Our facilities department has to get its arms around the whole thing, but it’s fair to say, it’s wide open. The last word has not been spoken.” When asked about SOM’s response to news of the win, the dean said he had not spoken to the architects as of four days after the award was announced. The proposal to be one of the largest net-zero buildings in the country would require aggressive sustainable gestures, starting but not ending with the largest photovoltaic array in the city. “This will not be an object building,” Duffy said. Whether it will be an SOM building, at this point, remains to be seen.